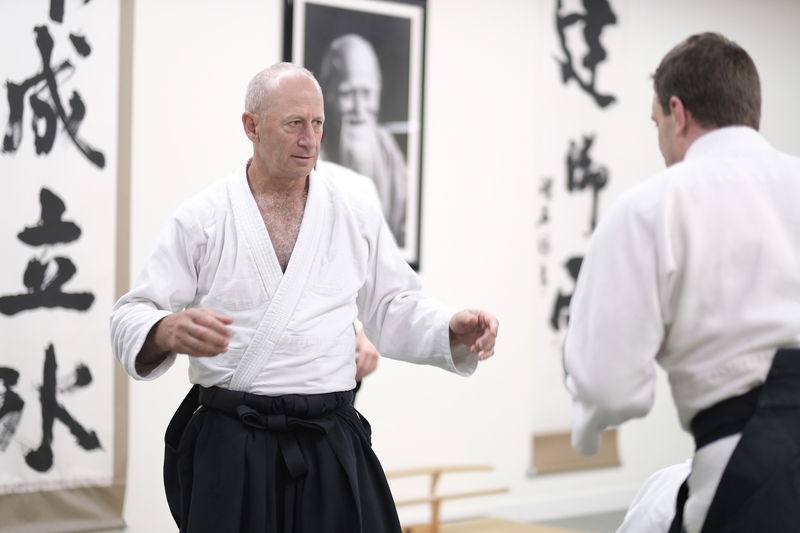 This photo journal shows highlights from the new Aikido Journal‘s first seminar, led by Bruce Bookman Sensei. 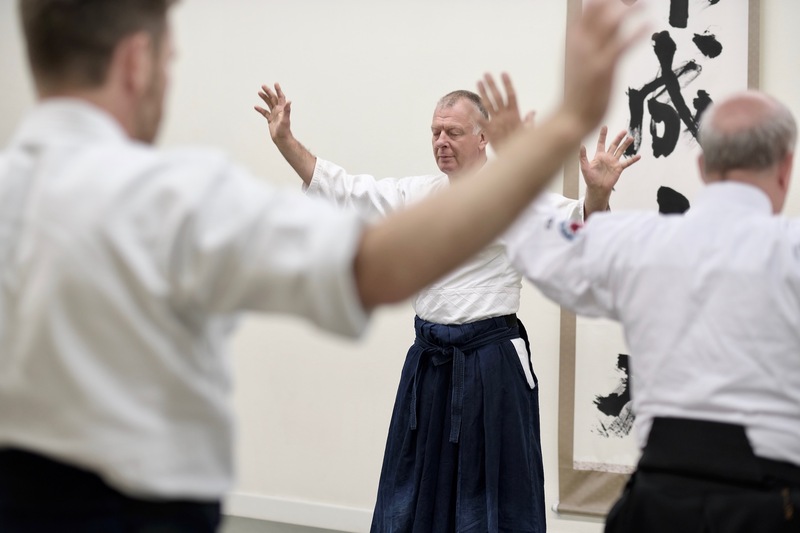 Designed for instructors and limited to 18 participants, sensei from the United States and Canada converged on Ikazuchi Dojo to learn from Bruce Bookman, one of the community’s most innovative aikido technicians and a highly successful professional dojo operator. 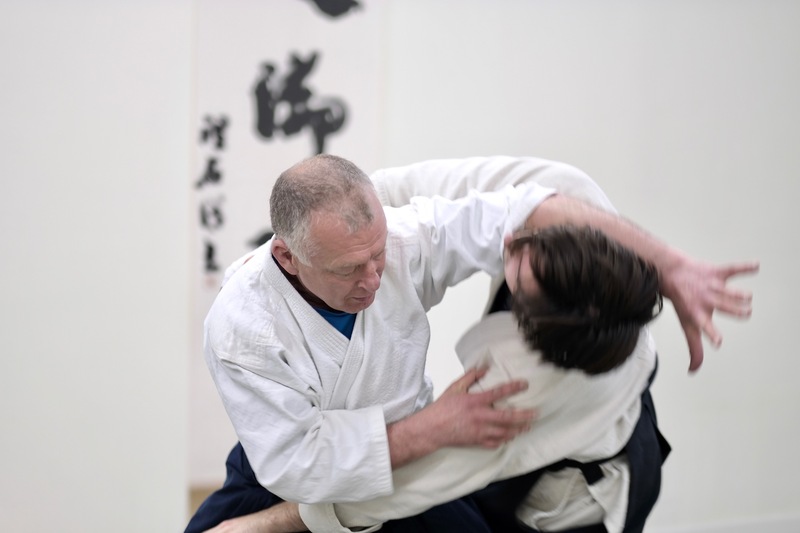 Images by Aikido Journal photo journalist Anne Lee. Bruce Bookman, preparing to bow in and begin the seminar. The seminar starts with breathing exercises and a short warm-up. 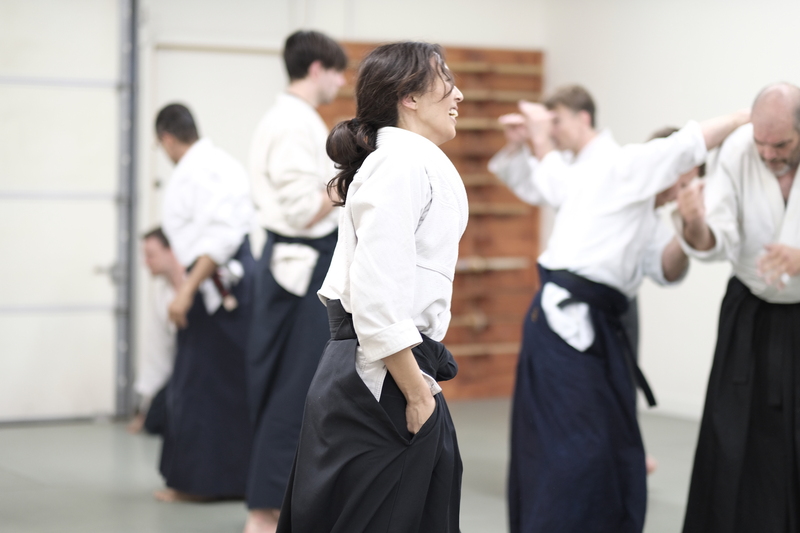 Technical practice begins with classical aikido techniques, beginning with suwari-waza Ikkyo and transitioning into standing Ikkyo and Iriminage. Bruce Bookman has an amazing ability to break his partner’s balance. 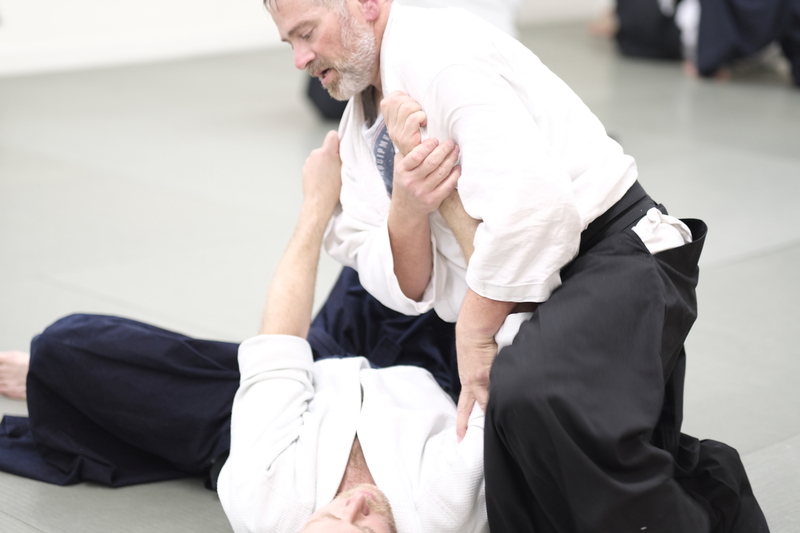 He whipped his uke (Thomas Segen, 3rd dan) around the mat like a wet towel before finishing this Iriminage. 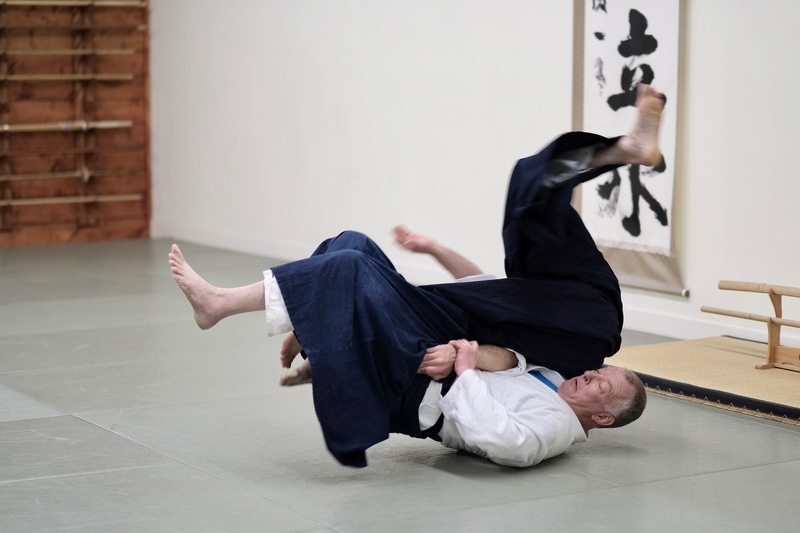 After working with a series of classical Shomenuchi attacks, Bookman transitions into defenses against modern striking techniques. 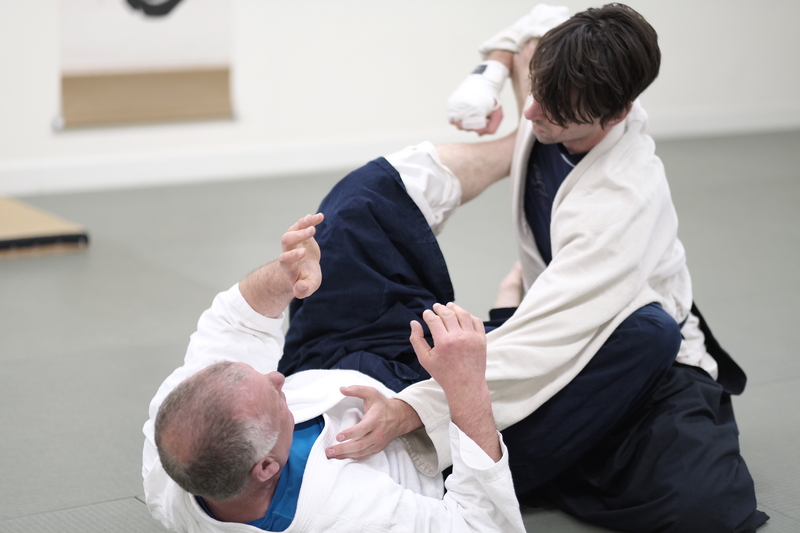 Here he employs a covering entry to close distance on his partner, who is throwing high-speed jabs and crosses. After moving safely through optimal striking range, Bookman postures up and executes a Kaitennage or Iriminage. 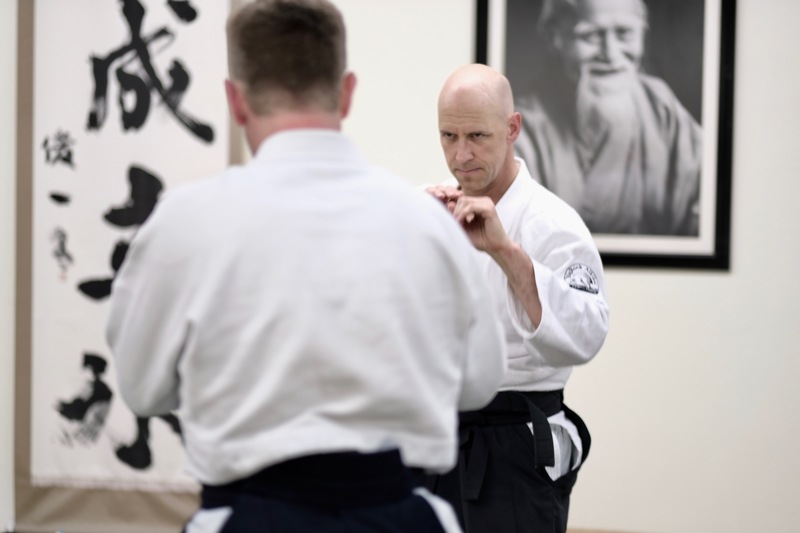 Gary Snyder from New York (7th dan under Shuji Maruyama) pairs with Jason Perna from Philadelphia (4th dan) to practice closing-the-distance drills against jabs and crosses. Craig Dunn from New Mexico (4th dan) and Chris Jones (3rd dan), an Ikazuchi Dojo instructor. Picking up the pace after getting a feel for this new entry technique. Kevin Ellwood from Canada (5th dan) pairs with Chris Bergerud from Colorado (3rd dan) . Flowing into Kotegaeshi from a new entry used against a series of jabs and crosses. 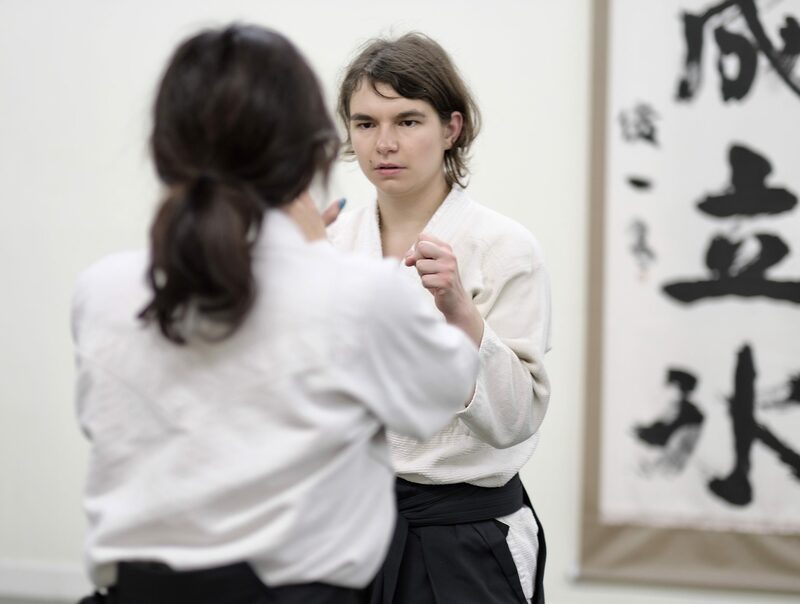 Nastia Shuba (2nd dan), an Ikazuchi Dojo instructor, getting ready to throw a right cross. Bruce Bookman shows an alternative Kotegaeshi pin that was shown to him by his friend Tom Collings, an aikido and law enforcement veteran. 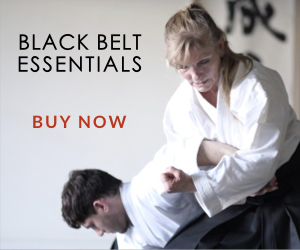 It’s a slight variation from the classical form but provides a couple tactical advantages – transitioning into the pin can be executed more consistently against a resisting opponent and it offers a greater ability to immobilize someone who has a limited range of motion through the shoulders but to do so without pain. Of course there are trade-offs and the classical variation is better-suited in many scenarios. Everyone enjoyed seeing the alternative form and exploring its mechanics. Bruce Bookman setting up the pin on Ray Feliciano from San Francisco (5th dan and BJJ brown belt). Roy Dean (3rd degree BJJ black belt) armed with a new 4K camera to capture the event on video. 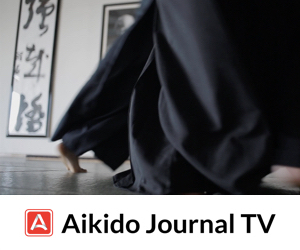 The video will be used for an upcoming Aikido Journal Academy online course. 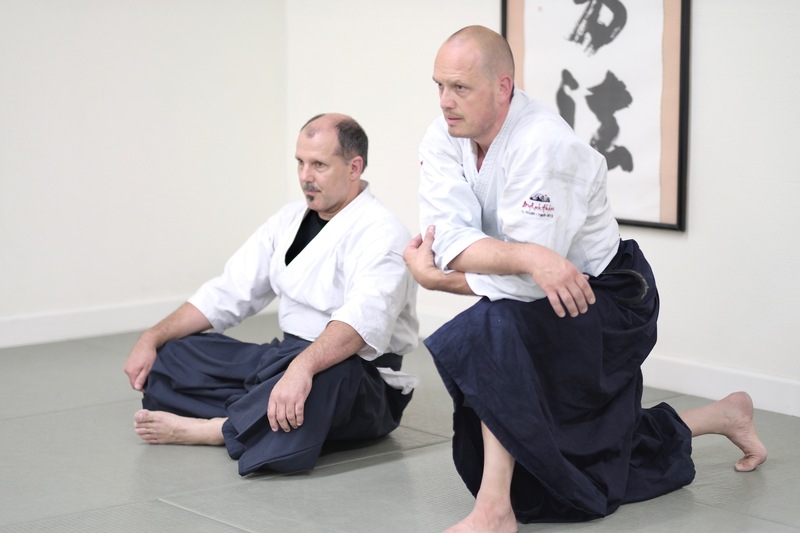 Also pictured here are Dan Jones from Calgary, Canada (3rd dan) and Jonathan Swift (4th dan), an instructor at Tenzan Aikido and a direct student of Bruce Bookman. 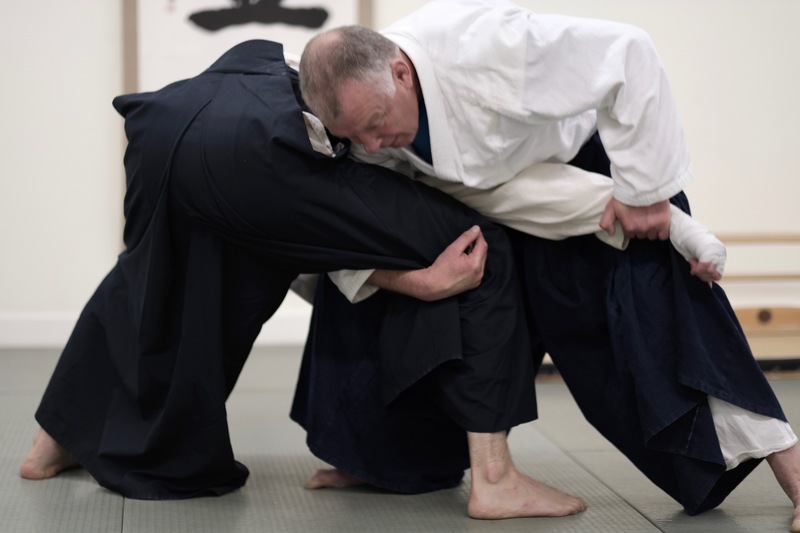 In this interesting variation of suwari-waza Sumi-otoshi, Bookman places his foot to the outside of his partner’s knee to prevent him from repositioning his base of support. It makes for a gentle, controlled throw that reduces a partner’s ability to counter and regain balance. 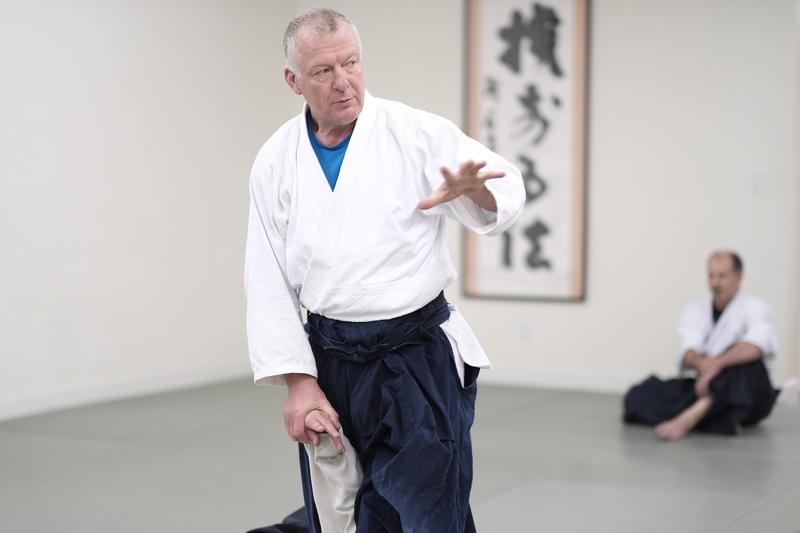 Bruce Bookman showed a fascinating transition from a classical Sumi-otoshi to a jiujitsu knee-on-belly posture and then flowed through it into a classical aikido seated pin. Without convoluting different movement systems, he demonstrated an amazing ability to transition seamlessly between them to fill gaps and maintain continuity of control. When squared off against a boxer, he’d have his guard up, chin tucked, and back slightly rounded. He’d dance around the mat with his partner until he closed distance. Then he’d immediately transform into an upright, open aikido posture and execute a classical aikido technique. 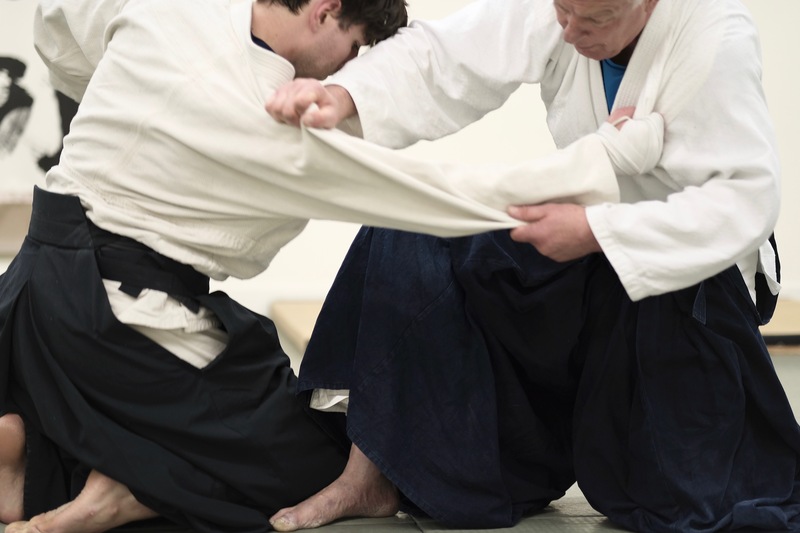 If the uke hit the ground and a traditional aikido pin couldn’t immediately be applied, he’d pounce on them in a signature jiujitsu style, move the uke, and then finish with a beautiful classical aikido seated pin. It was amazing to watch. 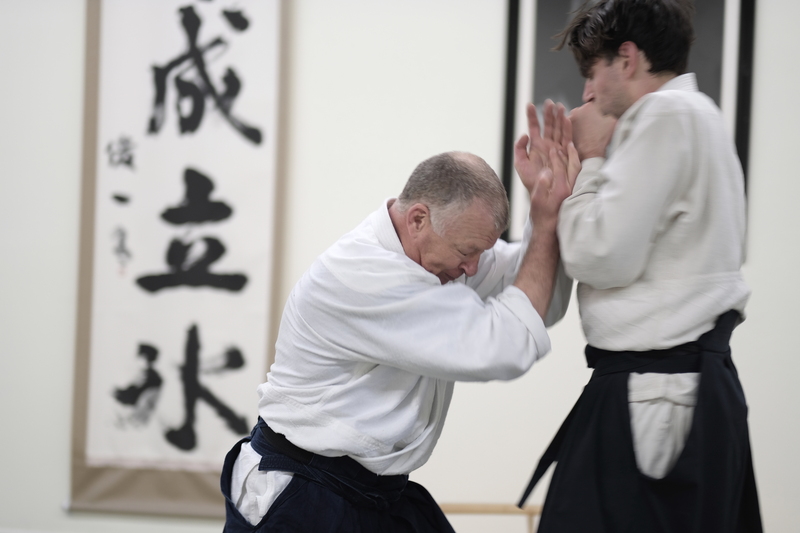 Mike Rossi from Corona, California (3rd dan), learning the transition from the knee-on-belly position to a classical seated aikido shoulder pin. Craig Dunn transitioning into a very secure and convincing pin on Josh Gold. 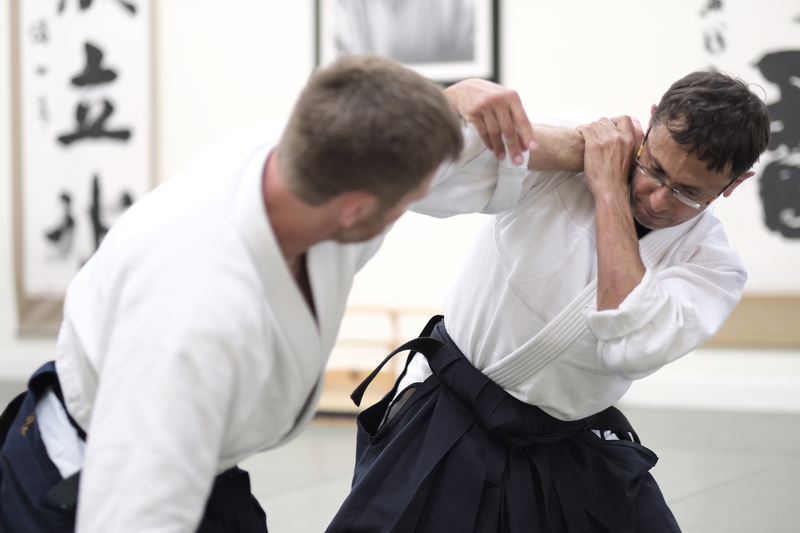 Cesar Moran-Cahusac from San Francisco (3rd dan) has twenty years aikido experience and served as Chief Instructor of a dojo in Peru for twelve years. Cesar now trains at Maru Dojo under Ray Feliciano. Next-level henka-waza (technique transformation) practice begins. 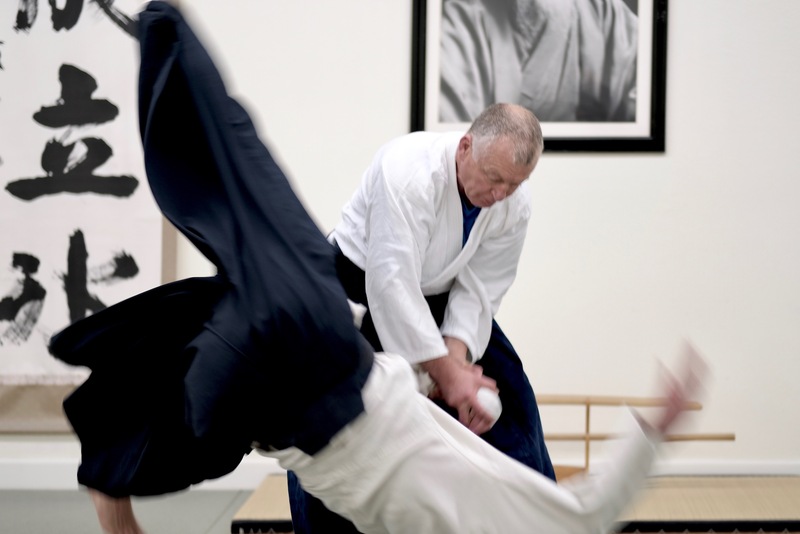 Bruce Bookman shows how execution of a Kaiten-nage can allow your partner to turn in for a double-leg takedown. He responds to the double-leg takedown with a sutemi-waza (sacrifice throw) that ends in a simultaneous leg lock and arm lock. A room full of martial arts experts attempting to figure out what just happened. After Bruce broke down the details, everyone was able to decipher the movement quickly and execute the throw and locks with consistency. 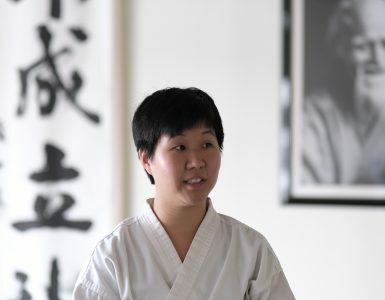 Karen Kim (shodan), an assistant instructor at Ikazuchi Dojo, was the most junior person on the mat. She had a great time at the seminar and loved the henka-waza practice. 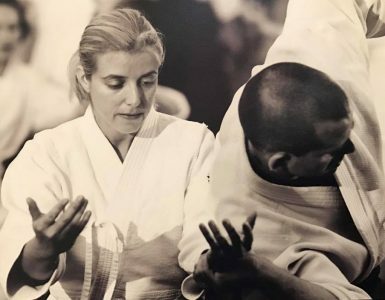 Karen met Bruce Bookman the month before the seminar when she traveled to Seattle to participate in Tenzan Aikido’s women’s self-defense intensive. 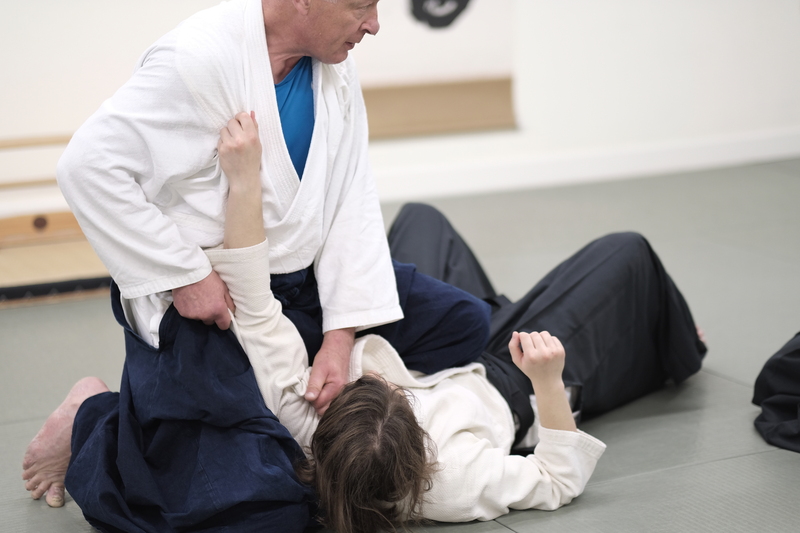 Bruce shows an alternative double-leg takedown henka-waza that flows into a Sankyo control. Bruce Bookman shows how to use the legs to defend against punches from a compromised position on the ground: tools to get out of an undesirable position as safely as possible. The seminar included a Q&A / structured discussion session with topics focused on dojo management and leadership. 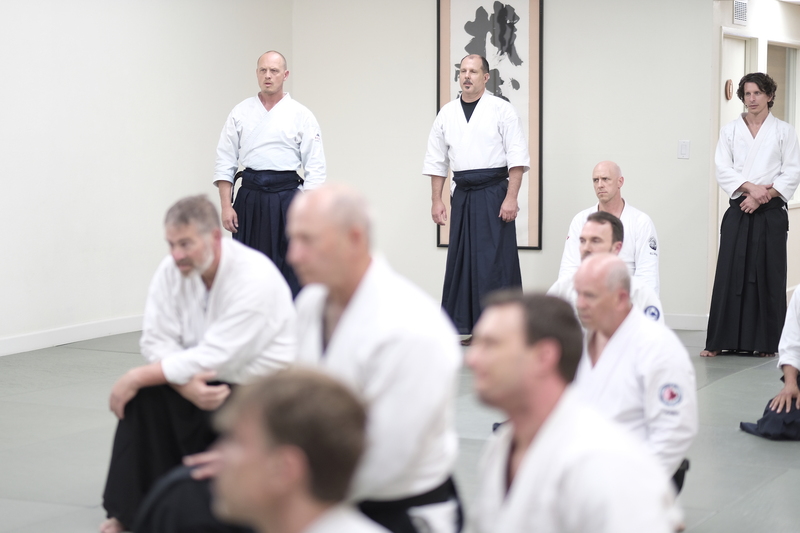 Pictured here during the Q&A session are Philip Greenwood from Temecula, California (6th dan), president of the Nishio Aikido Federation of the US, and Steve Erickson (6th dan), Chief Instructor of Big Rock Aikikai, a 300-student dojo in Calgary, Canada. 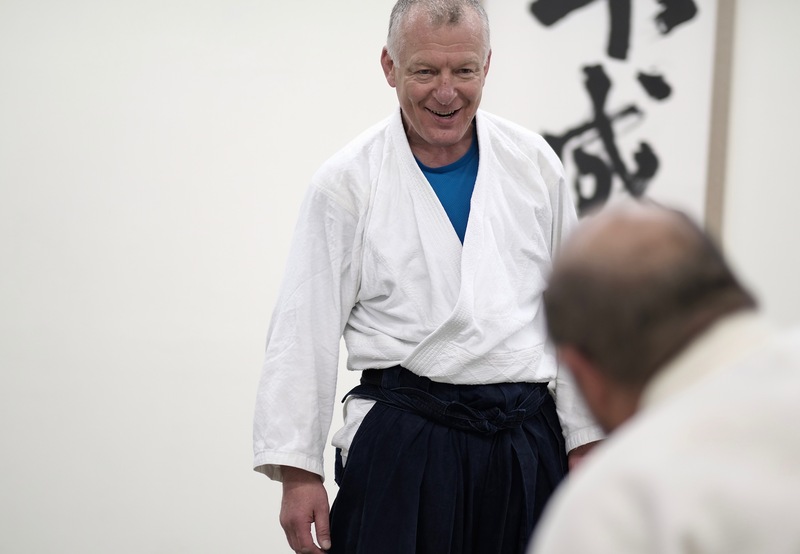 Haruo Matsuoka (6th dan), Chief Instructor of Ikazuchi Dojo, presents Bruce Bookman with a piece of calligraphy brushed by Seiseki Abe, O-Sensei’s calligraphy teacher. 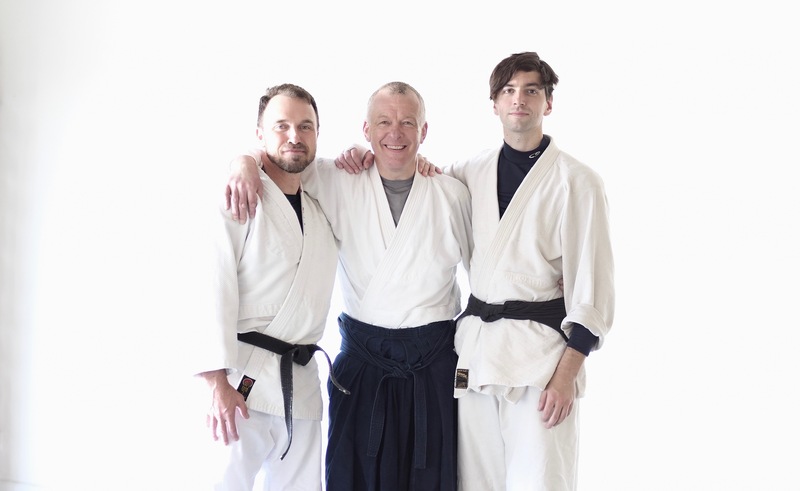 A special thanks to the Tenzan Aikido crew: Jonathan Swift, Bruce Bookman, and Thomas Segen (l-r). 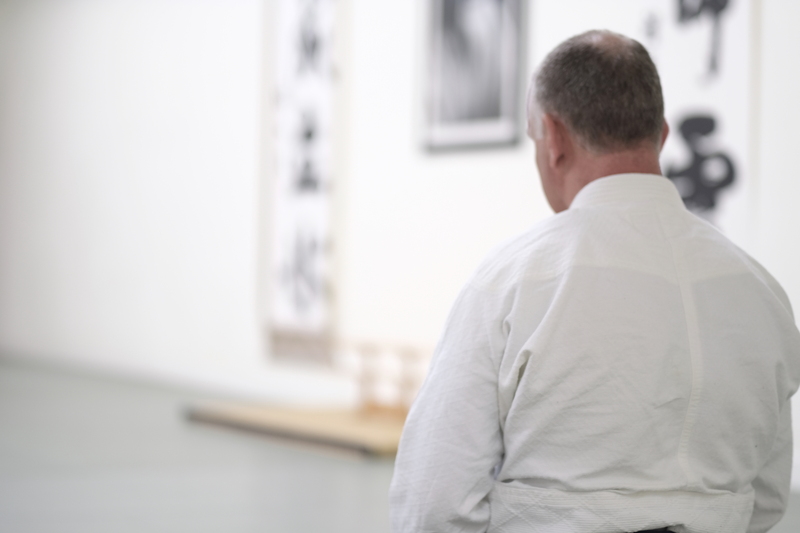 The day after the seminar, Aikido Journal Academy led a video shoot with Bruce Bookman, Jonathan Swift, and Thomas Segen that will serve as the foundation of our next online course. Coming summer 2018, the course will include the entire curriculum from this seminar and much more. 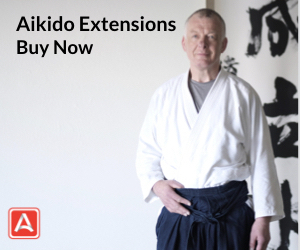 Years ago I purchased two VSH training videos from Bruce Bookman with him being the lead instructor which I still use in Aikido Institute of Mid-America Seidokan Aikido today. 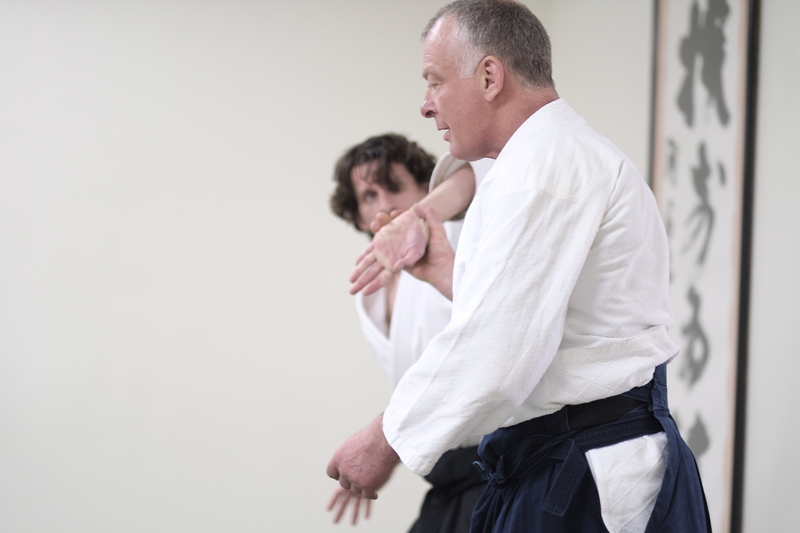 Chief Richard Harnack Instructor, when I am working with beginners on Ukemi. I can’t tell you how long I had the tape but it been a long long time. I hope this is not the last of this seminars so I can attend the next one, having a teacher such as Bruce Bookman show a well rounded technical system of Aikido including grappling and striking is something that I hope inspires other teachers to train and explore so they can offer their students a more martially effective training. 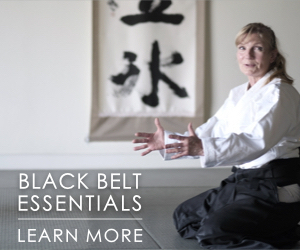 We’ll also have an online course and video from the seminar available in the very near future. I think that will give you a lot of great stuff to work with. Bookman Sensei and his technical approach are very impressive. How do you generally do sumiotoshi? In every version that I know the front foot goes outside of Uke’s foot as to prevent him from repositioning. 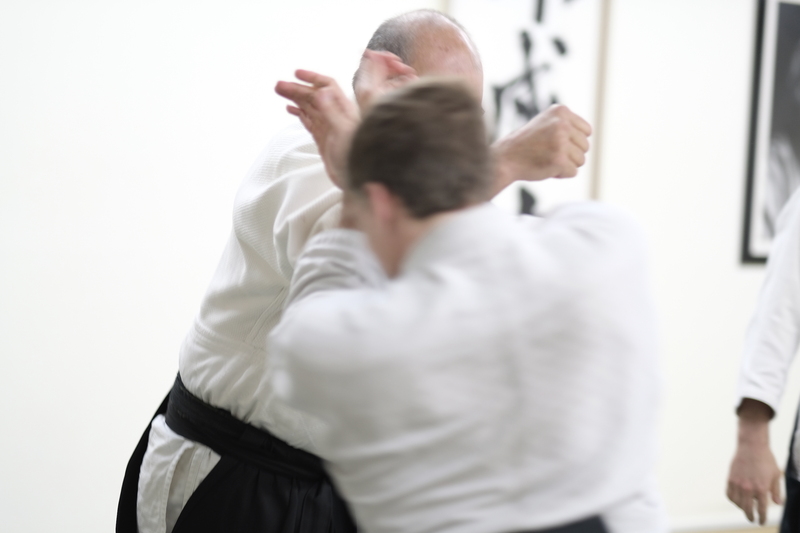 The grabbing of the sleeve along with the shoulder to execute it is the more interesting part.